The "story" themed cakes, whether they are for a wedding or a celebration, can be one of the more challenging projects to design for, because it requires the cake designer to successfully merge the interests and personal styles of two different people. The more drastically different the styles of the people are, the more difficult it is for the designer. In the case of Bronwen and Matt, we were initially provided with more themes and inspirations than we could possibly fuse into even three cakes. Not everything would make it into the story, or go together aesthetically, so we worked with them to edit and narrow down the choices. It was a worthwhile process and allowed us to play up the themes they did choose and give them their own starring role in the story! A wonderful perk of working with talented sculptors is they offered to build custom cake stands for each of their wedding cakes! Having the couple who can build just about anything (seriously!) meant we would have some truly fabulous cake stands for the cakes, and they could be designed however Rick and the couple would want! 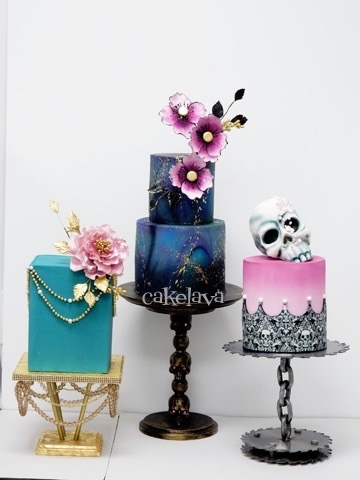 When Rick designed each of the three cakes, he also designed cake stands to reflect the theme and style of the cake. Using these ideas, Bronwen and Matt added a few special touches to the cake stands, which we loved, and the results are shown below. It was a beautiful collaboration between the three of them and the stands looked incredible with the cakes! Not surprisingly, a couple with three wedding cakes, chose three different flavors to serve their guests. Onto the cakes! 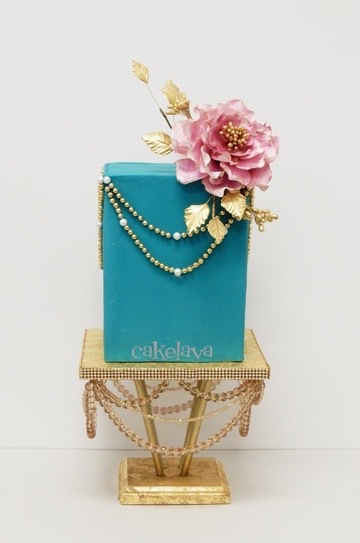 Themes/colors: Turquoise, gold, delicate pink (soft magenta), pearls, vintage, delicate handcrafted flower with gold accents. Custom built vintage inspired cake stand. 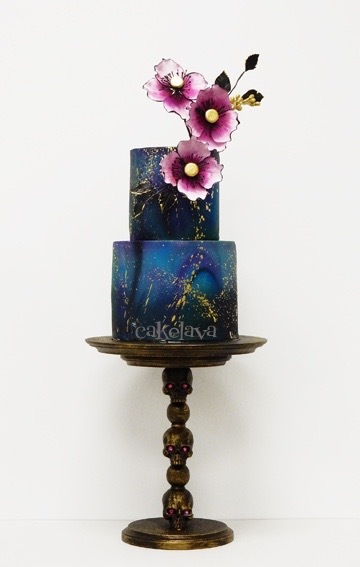 Themes/colors: Turquoise, blue and black to resemble Night, flecks of gold for "stars", magenta handcrafted flowers, gold accents. Custom built skulls themed cake stand. 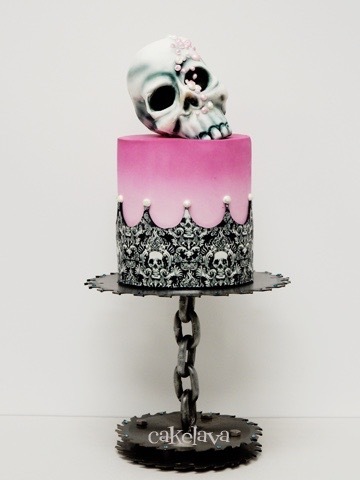 The third wedding cake: Referred to as "Matt's cake"
Themes/colors: Magenta, black, white, shiny, silver, skulls, pearls, sawblade. Custom built sawblade cake stand. On their own, the cakes were beautiful, unique and special, and as a group they complemented each other exquisitely! Each cake told its own story, and together, the trio of cakes told the story of Bronwen and Matt, and it was spectacular!